This was when we realized that we had messed up and discarded the last leader instead of passing it on. Oops! My final Leader let me play a card from the discard pile for free. I was hoping for a green card (science symbol), but Professor had already played a card from the discard pile and took the only green card. I was disappointed that my starting hand didn’t have any green cards, and Professor indicated that he had at least one. He also pointed out that he would be passing his cards to me. I took this to mean that he was going to be nice to me (his wife), by passing me a green card. Instead, he played one, participated in the Great Work, and passed me a hand with no green cards. I only held it against him until I was able to participate in the Great Work. President Gamer didn’t realize he could participate in the Great Work more than once, and said he could have prevented Space Cat from participating. It was definitely more challenging to participate in the GW with so many players. There’s a lot to consider as I look at the hand passed to me – what can I play for free? What resources do I have access to? If I pass this green card, will Space Cat get it? Clumsy Ninja is amassing an army next to me, if I pass this red card, will she play it? Should I work on the next stage of my Wonder? What will give me the most victory points at the end? With the GW, I might now be considering playing a card I would have passed over. Depending on the GW, there can be a nice pay-off to participating like an extra science symbol, so I’d be more willing to pass on a card that I normally would play. Some pay-offs don’t seem worth it, but preventing the penalty might be motivation enough to participate. The GW aspect of this new expansion works well with current game play. The Babel tiles caused some confusion. Some didn’t understand exactly what they would do in the actual game, so they didn’t want to play them. Some didn’t understand the benefit of playing tiles (each tile played adds points to your score). Professor had a good strategy: play the bad tiles first because then people will want to cover them up with better tiles. In normal game play, you can discard a card for three gold or play the card face down as a stage of your Wonder. In both cases, you are the one who benefits from these plays. Discarding a card to play a Babel Tile either benefits everyone or hurts everyone. I had a BT which allowed everyone to play cards based on their neighbors’ cards. For example, I had played the Altar which lets me play the Statue for free. The BT would also let Clumsy Ninja and Professor play the Statue for free. That sounds great, except that my neighbors are the ones passing me cards, which means I could lose out on those free to play cards. I’m not sure how I feel about the BT. 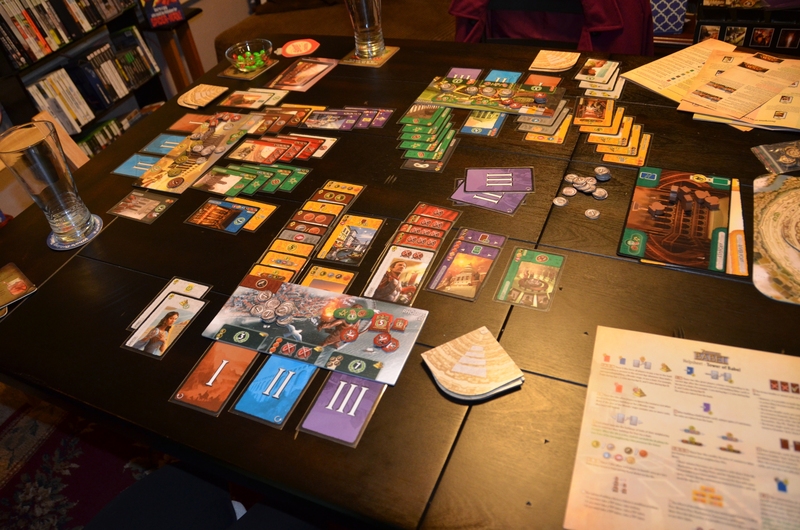 The tiles that were played were a nice aspect of game play. We had resources we wouldn’t have had otherwise. It’s the actual playing of the tiles that we were struggling with. Further game play may help. 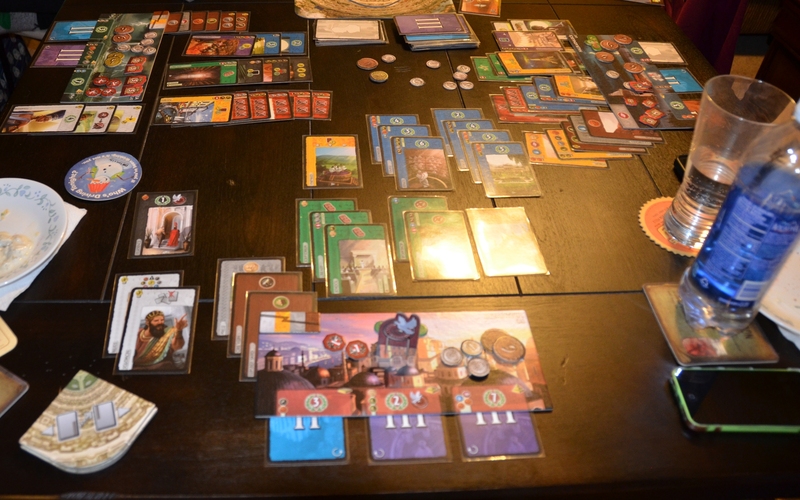 We play 7 Wonders a lot, so we know the cards we like and the strategies that work for us. This new element is asking us to give up some of that. Clumsy Ninja ended up building a huge army because the round one GW penalty left her without glass. I didn’t have glass and neither did Shutter, so the only cards she had resources for were the army cards. It had been so long since Shutter had played, she forgot why she liked the blue cards so much. She ended up playing mostly yellow cards, and I played a lot of blue ones. 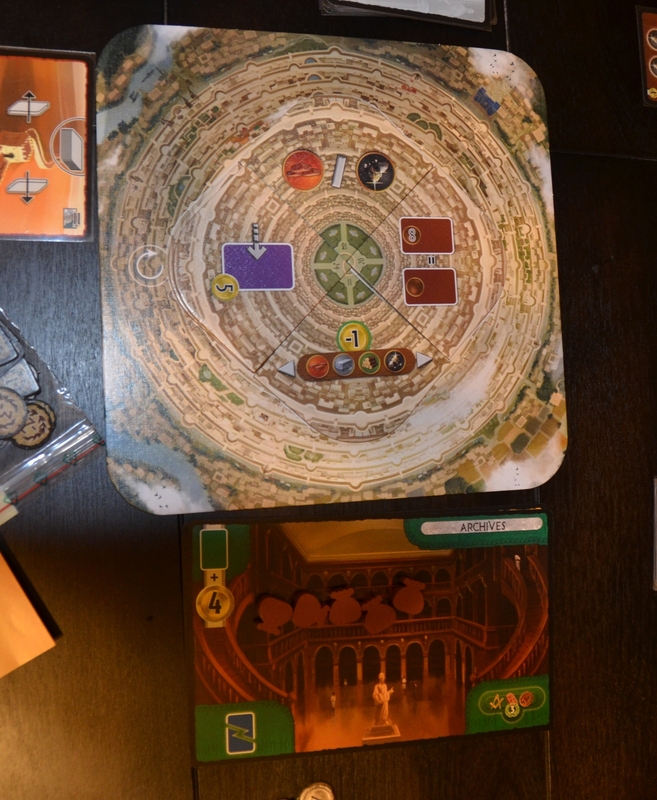 President Gamer remarked that he had more gold than he’d ever had any other time we’ve played. He also wanted to know if Babel had added any extra cards because he thought the “flop” was weird. It might have been because Shutter played differently than in the past, and her hand affected his two out of the three rounds.